I have dedicated these words with love and respect to my flying friends. This book is an expression of appreciation for the community of American Airlines. A community which was my world in the 1950s. Cover: Boeing has given permission to use their photo of the new Boeing 707 leaving Seattle for Los Angeles for the Inaugural Flight. That photo is on the cover with me in my brown 1957 American Airlines uniform. I was on the Boeing 707 Jet Inaugural Flight on January 25, 1959. This book welcomes the reader with snapshots during the golden age of flying from carrying mail to a time when excited passengers were treated as guests and everyone dressed in their Sunday best to board American Airlines. It is engaging and appreciated.We served the flying public with much, much "More Than a Ticket." We had time to hang coats, learn names, have a conversation, serve a delicious meal and hold babies. You will feel the excitement of times gone by and get a glimpse of how the atmosphere of air travel has changed through the years. The drama of time has created a different picture. 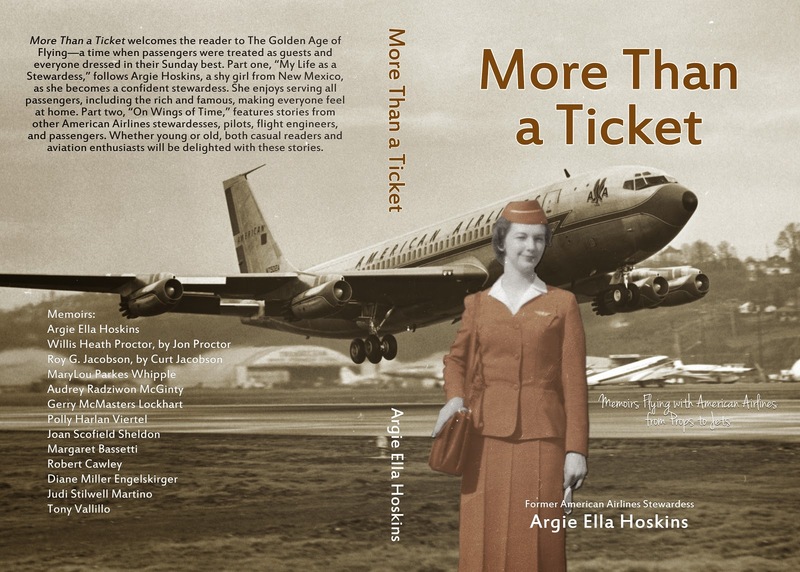 My book "More Than a Ticket"
Part one: "My Life as a Stewardess," takes the reader on a journey with a shy country girl to the city, but she is still a country girl as she becomes a confident stewardess serving all passengers, including the rich and famous, making everyone feel at home. How did she do it? Part two: "On Wings of Time," features short stories from American Airlines stewardesses, pilots, flight engineers, and passengers. Both the young and old, casual readers and aviation enthusiasts will be delighted with these memoirs from the contributors. Booking Buddy is the #1 travel search website, that you can use to compare travel deals from the large travel booking sites.